HIGH LUMENS / 4 MODE: H1 Tactical LED Flashlight Use Cree XHP 35HI, Military Grade Bright LED Flashlight 3800 High Lumens, Over 3200 Ft Beam Distance. 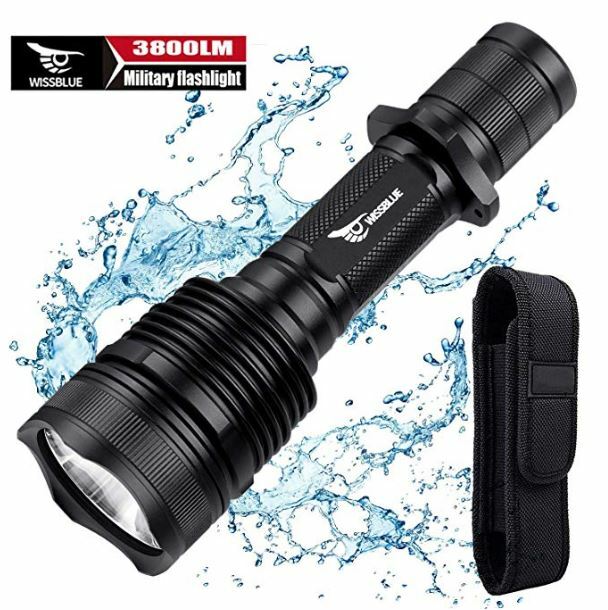 4 Modes, Low-Medium-High-SOS（Double Click To Use）, Suitable For Camping, Hunting Flashlight, Outdoor Climbing, Hiking, Night Riding, Emergency Lighting, Tactical Applications And Installation Of Rifle Flashlight MILITARY GRADE IPX8 WATERPROOF: Tactical Flashlight H1 Uses Aerospace Grade Aluminum Alloy, Kevlar Hardened Three-Layer Military Coated Shell, Sturdy And Durable.High Lumens + IPX8 Waterproof Design, Using Military Grade Fully Sealed Tactical Circuit Board, Used In Outdoor, Snorkeling, Harsh Environment. It Is The Perfect Military EDC LED Tactical Equipment. TACTICAL INNOVATION: The H1 Tactical Military Flashlight Uses Japan'S Highest Grade 10W / MK Thermal Silicone To Ensure That The Medium-Sized H1 Tactical Flashlight Drives 6A At The Lowest Temperature; With 3800 Lumens Of High Lumen Lighting, The Anode Cup Provides Perfect Aperture Illumination. With The Addition Of Military-Grade Tactical Technology, Daylight And Sharpness Have Been Enriched. The H1 Can Surpass The Same Type Of Tactical Flashlight And Become A True Tactical Flashlight High Lu WIDELY APPLICABLE: High-Quality H1 Military-Grade Tactical Flashlight Set Contains 3350Ma 18650 Battery, Flashlight Holster, Charging Seat; 18650, RCR123, CR123A, Can Be Used As H1 Tactical Flashlight Power Supply. WARRANTY AND SERVICE: All Flashlights Undergo A Rigorous Quality Test Prior To Packaging And We Offer A One Year Warranty. If You Have Any Questions, Please Feel Free To Contact Us. We Will Solve Your Problem Within 24 Hours!